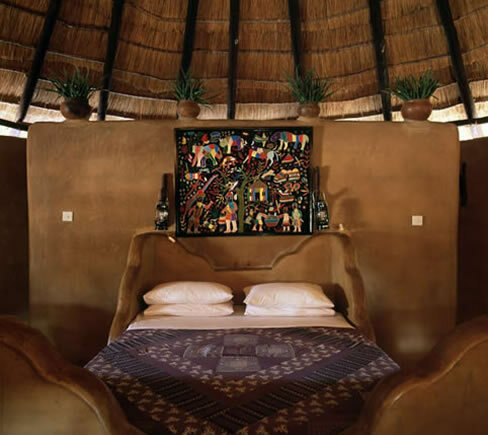 In a universe of safari lodges and bush camps with their refined decor schemes and demure palettes, Planet Baobab presents an entirely different proposition � a delightful Technicolor collision of ethnic pattern, traditional architecture and graphic African imagery. 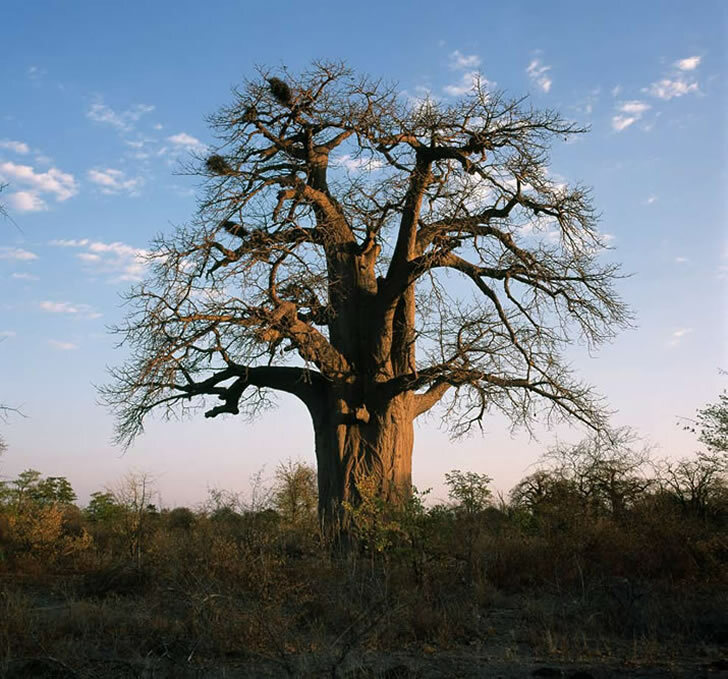 It�s humbling to learn that the average age of the 17 baobab trees that give Planet Baobab its name is an astonishing 4 000 years and that the lunar-like landscape of the Makgadikgadi salt pans that border the camp cover the same area as Switzerland. 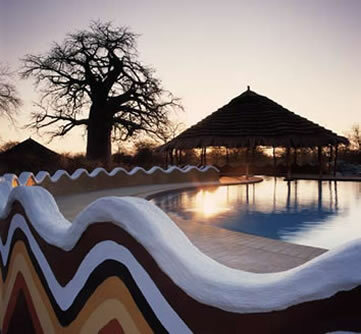 In fact everything about Botswana�s Kalahari desert region is awe-inspiring, from the diverse animal and plant species that it supports to the rich cultures of the indigenous people that call it home. 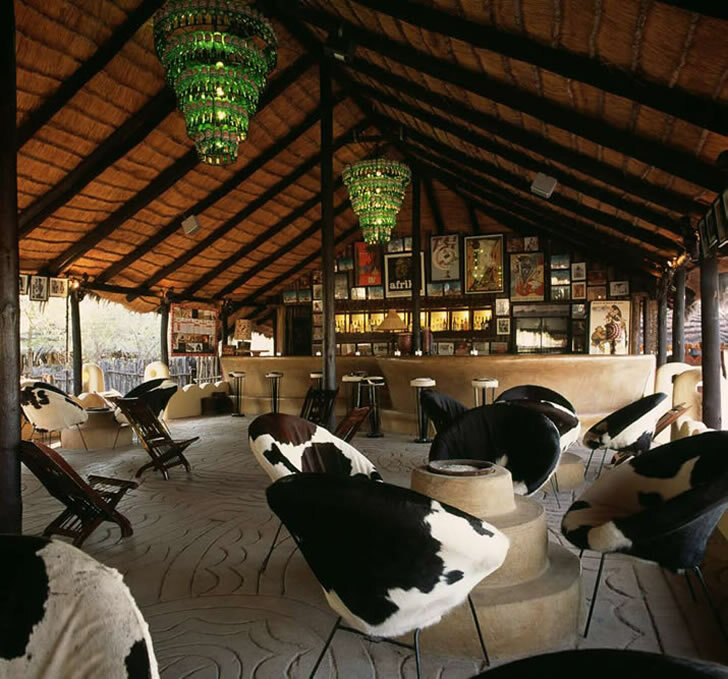 Planet Baobab is situated along the dusty asphalt artery that connects Maun and Francistown, a place where cars come to a shuddering stop for passing elephants and the cracked, bone-coloured landscape is positively surreal. Instead of the splendid isolation offered by its more bush-bound counterparts, Planet Baobab evokes the welcoming bustle of a roadside pit stop in the middle of nowhere. Planet Baobab is not your average high-end safari destination. That�s not to say it isn�t accomplished in its design approach, that its services are anything but first-rate or that there aren�t multitudes of inspiring ideas to uproot and incorporate into your own space. But its atmosphere, architecture and interior details dance to the beat of a different drum in a composition that is eclectic, refreshing and from the heart. 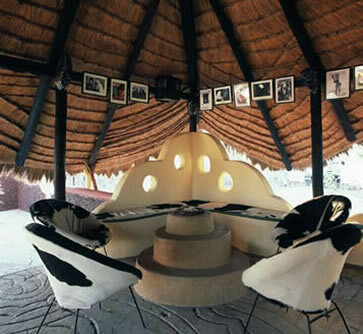 Planet Baobab is unique in that guests can choose from several accommodation options, from huts fashioned in the local vernacular to offloading one�s tent from the 4x4 and pitching it in a specially designated area. The leisure opportunities here are equally diverse and include guided walks and quad-bike trips into the bush and salt pans with expert guides (only one path is used to prevent excessive ecological impact), overnighting under the stars, rubbing elbows at the shebeen (bar) with the locals and eccentric characters just passing through, or observing the elephants that lumber around at the nearby water hole. 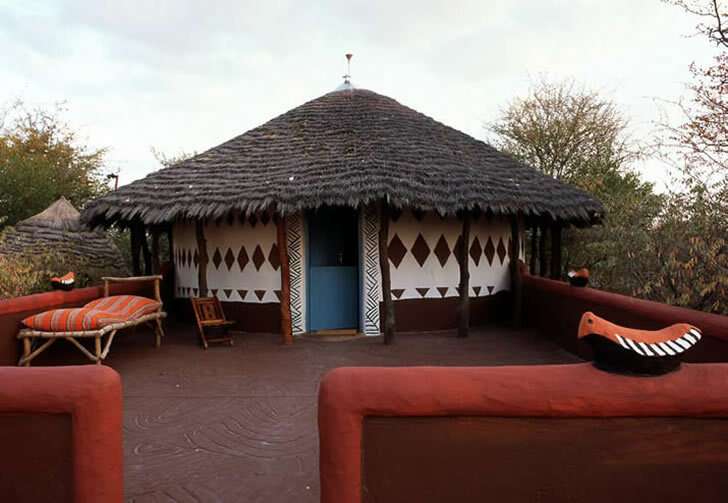 The architectural simplicity of the structures � particularly that of the en suite huts characterised by thick walls, small windows and shaggy thatch to keep them cool � has been directly informed by the traditional building styles and materials used by the region�s Kalanga people. So too the strong graphic patterning that adorns them, painted by the local women using mud and natural pigments obtained from charcoal, ash and termite mounds. While each hut is made unique by its own distinctive decoration, they are all punctuated by the same bright blue doors � a familiar local shade dubbed �Botswana Blue� as it is the colour most often used to paint doors and window frames in rural Botswana. Exterior spaces are based on the layouts of traditional lelwapas or meeting places. Although a basic simplicity of form underpins the architecture, it also displays distinctive elements of ornamentation. 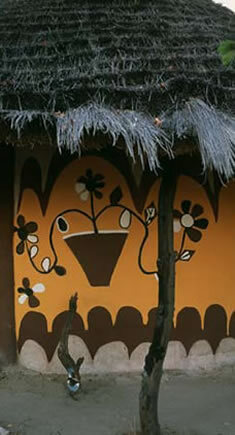 There are the abstract patterns that give texture to the floor of the shebeen, the quirky heart and cut-out circle shapes integrated into the squat walls and bench-like corner seats there, and the built-in beds and moulded open shelves in the huts, which are both obviously functional and beautifully sculptural. First and foremost, the interiors have been inspired by southern Africa. Catherine Raphaely drew on �the funky style of local shebeens and tuck shops and the creativity and ecologically correct approach to recycling of the townships and local villages� in creating the camp�s feel-good look. Everything that catches the eye has a vibrant visual appeal: cheeky green beer bottle chandeliers; quilted, patchwork and crochet throws; cheap and cheerful enamelware; Coca Cola-tin-framed mirrors, retro cowhide-upholstered hoop chairs and woven and papier m�ch� bowls; vintage African movie and travel posters; and nostalgic black-and-white photographs from the Drum magazine archive. A handful of traditional pieces, such as elaborately carved kgotla chairs and rustic wooden day beds, further enhance the authentic mood. The potent African brew that is Planet Baobab is, quite simply, a tonic for the soul.